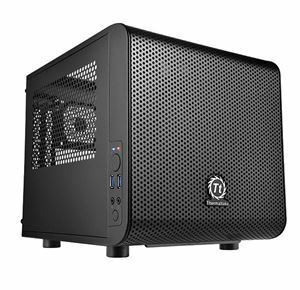 Quick overview The new Core V1 represented by Thermaltake is a small and cute ITX based chassis with a 200mm fan in the front panel. Smart interchangeable side panels allow users to flip it accordingly to showcase either for superior liquid cooling or superb airflow, which allows you to make your own personal setup. You not only grant to have a really powerful mini system, it also has the ability to house various overclocking components to keep it really cool! The sleek aluminum front fascia provides the striking yet subtle design that Obsidian Series cases are known for, and a top window gives you a close-up view of your high-performance components. The 250D is a great choice if you want full size performance in a small space.